Even before Barack H. Obama assumes the US presidency tomorrow, the American president-elect has been actively working on his South Asia policy, with Kashmir as its centerpiece. Not only did he send his vice president-elect Joe Biden to visit Pakistan, he has also reached out to his defeated presidential rival John McCain upon Mr. McCain's recent return from a Pakistan trip. In an unprecedented move, Mr. Obama has quietly consulted Mr. McCain about many of the new administration’s potential nominees to top national security jobs and about other issues — in one case relaying back a contender’s answers to questions Mr. McCain had suggested, according to the New York Times. More recently, Foreign Policy journal reported of a secret dinner meeting in Washington's Ronald Reagan Building where Obama listened to several key figures including Ahmed Rashid who flew in from Lahore specially for the occasion. During recent Senate confirmation hearings, the US Ambassador-designate to the UN, Susan Rice, identified Kashmir as one of the "hot spots" and included it with conflict-torn regions, including the Balkans and Golan Heights. Earlier in September, Mr. Bruce Riedel, recently formally appointed as Pakistan adviser by Obama, told a meeting of the Council on Foreign Relation, "We can't expect Pakistan to behave like a normal state, unless it has normal borders. And we can't expect Pakistan to behave the way we would like it to while it's obsessed and fixated on its neighbor and the problem in Kashmir. The problem in Kashmir has been in the doldrums for the past several years. 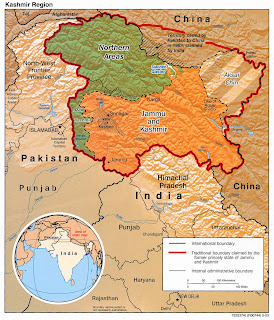 It is now starting to boil really quickly, and when Kashmir boils, the result is Indian-Pakistani tensions that can produce war. We've seen that over and over again," he said. The Mumbai attacks have only served to strengthen Obama's Kashmir thesis and sharpen his national security team's focus on resolving the biggest obstacle to peace in South Asia. This fact has recently been underlined by his British ally, Foreign Secretary David Miliband. After his recent trip to India and Pakistan, Mr. Miliband wrote for the Guardian as follows: "Resolution of the dispute over Kashmir would help deny extremists in the region one of their main calls to arms and allow Pakistani authorities to focus more effectively on tackling the threat on their western borders." The Indian government and media have been protesting the statements by Obama and Miliband in the hope of averting a serious intervention by the West to force a resolution of the long-standing Kashmir dispute that can potentially trigger a nuclear holocaust. Former president of the United States and the husband of the incoming US secretary of state Hilary Clinton, Bill Clinton, on the eve of his 2000 visit to the subcontinent, called the ceasefire line that divides Kashmir "the most dangerous place in the world". In spite of the angry noises from New Delhi, there are reports that former United Nations Ambassador Richard Holbrooke will be tapped as Obama's special envoy to South Asia. Miliband has called the war on terror "mistaken". Obama has refrained from the indiscriminate use of the label of "war on Terror" as a way to avoid solving fundamental issues. What Obama and Miliband are setting out to do will not be easy, either in South Asia or in the Middle East. There will be powerful opposition from the Indian and Israeli governments and their lobbyists and friends in US Congress. There will also be some concerns in Pakistan about imposing a Kashmir solution without taking Kashmiri leaders on board. But, to distance themselves from the misguided Bush policies and to leave a legacy of international peace of prosperity, Obama and his allies need to show tough love to their friends in India and Israel. The kind of tough love that makes two of America's best friends see what is truly in their own best interest. In an unprecedented move Obama has appointed Prof. Neal Kumar Katyal as principal deputy general solicitor. See the details http://in.rediff.com/news/2009/jan/20-obama-appoints-neal-katyal-to-top-post.htm. Looking at the details of work done by Prof. Neal, it seems a good move for the masses of India and Pakistan and a direct bad news for the extremists in general. I hope that our hopes are well-founded, insha'Allah! Inside a chandeliered ballroom Thursday, Indian diplomats and business leaders and American officials held forth about a new "Cooperation Triangle" for the United States, China and India. But little mention was made at the Asia Foundation's conference on Indo-U.S. relations of the Indian government's recent diplomatic slam-dunk. India managed to prune the portfolio of the Obama administration's top envoy to Pakistan and Afghanistan, Richard C. Holbrooke -- basically eliminating the contested region of Kashmir from his job description. The deletion is seen as a significant diplomatic concession to India that reflects increasingly warm ties between the country and the United States, according to South Asia analysts. Indian diplomats, worried about Holbrooke's tough-as-nails reputation, didn't want him meddling in Kashmir, according to several Indian officials and Indian news media reports. Holbrooke is nicknamed "the Bulldozer" for arm-twisting warring leaders to the negotiating table as he hammered out the 1995 Dayton peace accords that ended the war in Bosnia, a peace that has stuck. The arrest of Ghulam Nabi Fai signaling US shift in position to favor India on Kashmir will not change the ground realities of Indian Occupied Kashmir. India's military occupation of Kashmir will not last, and increasing brutality and repression of the people of Kashmir will only make the situation worse. And it'll continue to make a mockery of India's claim to "democracy".